NO puppies or adults available at this time. We hope you enjoy the photos and information found on the following pages and links! 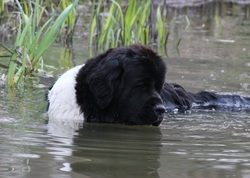 Please feel free to contact us about any of our Newfs or upcoming litters of black and/or Landseer puppies. If you are interested in a Breakwater Newfoundland puppy, please complete the puppy buyer questionnaire found under the Litter Information tab. You may return the completed form via regular mail or email. Please do note--physical fencing is a requirement for a Breakwater Newfoundland. Invisible Fence or similar fencing is not sufficient for proper containment. Acceptable physical fencing includes chain link, woven wire or privacy fence (wooden or PVC). We DO NOT SHIP puppies as we like to meet the potential new puppy's family! Please do not copy photos or information without first asking permission! Thank you!